Here are some free abs workouts for the obliques that you can do on the floor. You can do these workouts in 3 ways-- straight set, super set, or circuit style. Straight Sets: This is the easiest ab workout because you perform one exercise at a time and rest 30-60 seconds between every set before moving on to the next exercise. Super Sets: This is a little more challenging workout because you pair the first 2 abs exercises and do them together with no rest between the pairs. Circuit Style: This is the most challenging way to perform this routine because in a circuit style workout you would do all 4 exercises in a row with no rest between any of the exercises. After completing all 4 exercises, you should rest 60-90 seconds and complete the circuit again. Begin by crossing one foot over the other knee. Exhale and crunch up towards your knee. Lift your shoulder off the floor and be careful not to pull on your neck. Repeat 8-15 repetitions on each side. Sit on the floor in a V-sit position. Twist towards the left and then slowly twist towards the right. This is an isometric exercise. This simply means that you hold one position without moving. The side plank is performed by balancing on your elbow and your feet on your hand and your feet. Hold for 10-60 seconds on each side. This is one of my favorite ab exercises. Crunch your body off the ground and bring your opposite knee to your opposite elbow in an alternating fashion. Perform 15-25 repetitions on each side. Remember, you can perform this abs workout routine in 3 ways. Super Sets: With the technique you would pair the first 2 exercises. Perform the first exercise and then with no rest move immediately to the second exercise. When you finish the second exercise rest 30-60 seconds before going back to the first exercise. 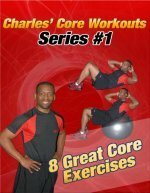 Once you have done each exercise 2-3 times move on to the second pair of ab exercises. Circuit Style: This is the most challenging technique because you would perform all 4 exercises in a row with no rest in between exercises. After you finish the 4th exercise you can rest 60-90 seconds before repeating the circuit from the beginning. Perform the entire circuit 2-3 times. Hope you have fun with these free abs workouts for the obliques. You can use any 4 abs exercises you like to create your own ab workout routine. Visit the Directory of Abdominal Exercises to learn all the ab exercises on this site.